This is the second and last part of the BMX rebuild. I have skipped a few steps in the illustrations since some other articles in this blog cover these. Another thing of note is that this was the first time I had to reassemble a threadless fork without having the benefit of prior disassembly. So don't go thinking that I am a court testifying expert on the subject. I reassembled it until it was solid, took me half an hour to figure out. The main difference with a threadless fork is that the gooseneck plays a major part in holding everything together. So make sure it is properly tightened and take note that the hex bolt on top of the gooseneck is just a cover plug, it has no mechanical value in the process. When putting back a BMX together, or taking it apart, check if all the small hardware is up to snuff while you're there. While rebuilding this thing I found a frayed brake cable that had but one strand to live. This BMX only has one brake caliper, imagine the deception of it's owner when that cable would've snapped while trying to avoid hitting a bus or something! So get dirty and have fun, until next time, ride safe. 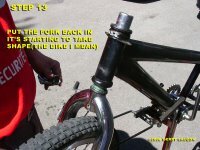 hi could you help me i have a bmx and i removed the gyro but now the fork wobbleshow can i stop it?? Like I said in the article, this was my first threadless fork. You need to tighten the fork in place with the screw inside the steerer tube before locking in the stem. But I would really recommend going to your local bike shop to fix that if you don't know what you are doing for sure. That would be my best recommendation. Ah! At last someone with the right info. Thank you for the information, now everybody should be well informed. I have a really ugly bike, which is good because I live in Allentown, Pa. The tire was flat so dummy me took it apart. Now I can't find any pictures of the rear wheels so I can put the chain back in the right spot. I should have taken a picture first. Please help! I 'd rather have no gears, it's easier. 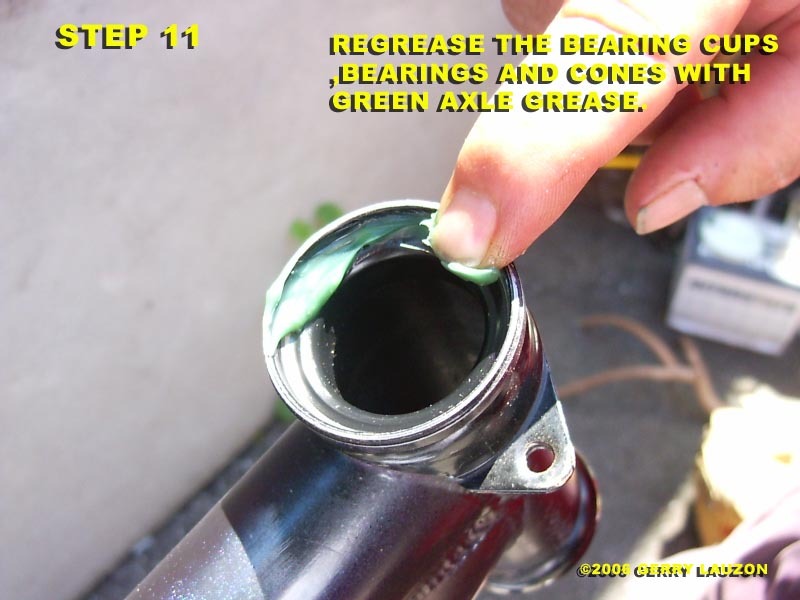 check out the article about removing a wheel. The link is on the left of the page. Just rest the chain on a gear and it should take care of itself. I'll need a more specific question than that to help you out. Just look at the earlier comments of this post and you will see one from bikerdude who volunteered the proper information about these. I still don't have the hang of it and I have to work on this. 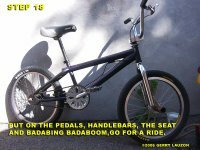 i just bought a second hand bmx and the seat keeps coming loose even after i tighten the bolts. i cant seem to find a new one to buy online.. what should i look for(call it)?? The seat is probably still good, it's the hardware that holds it to the seat post that is probably used up. 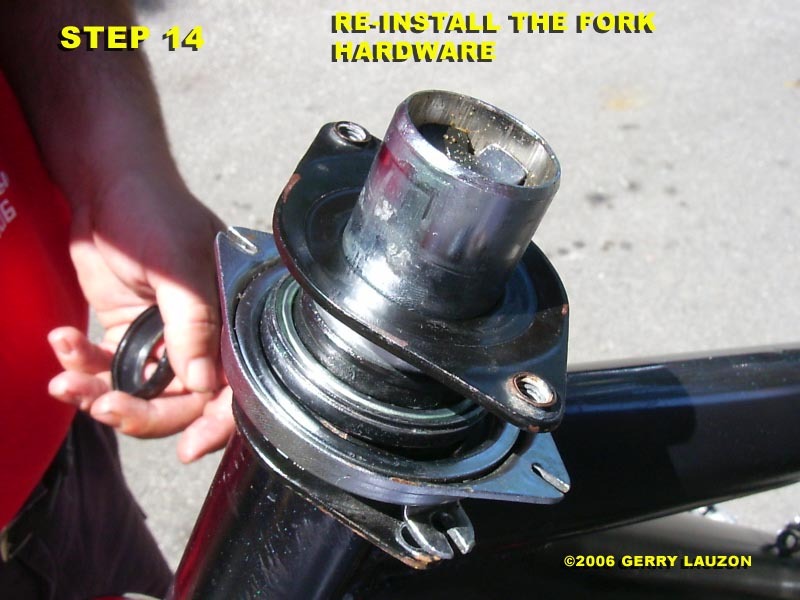 You can take the hardware, nuts, bolts and clamp, from another seat and put it on yours. Worst case scenario, replace the seat. 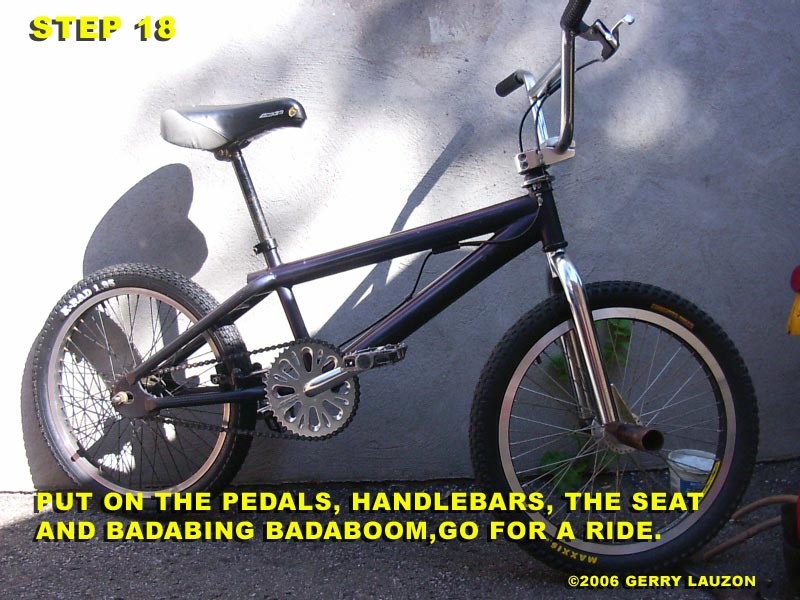 hi gerry lauzon and i have a bmx. while im driving the rear wheel pulls stiff. i have tried to fix it but nothing works. could it be the bearings. please help!!!!!!! Pull the wheel off and see if it turns freely while holding the axle with your hands. The only other thing I can figure out would be that the tire is rubbing on the frame. Hi, i have removed the GYRO from my BMX but now my forks wobble. Can you help me???. Check out the comments on this post. 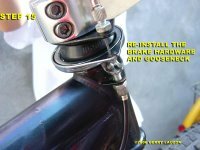 There is a very well explained procedure involving the stem bolt that will prevent that wobbling. thanx for the help but u should probably mention when put on the tire and how to check if the tube has a hole!! hi, awesome blog you have, im trying to take some forks off a frame, nearly the same as the set up in your step by step, do i need to tap it out with a hammer? i cant see any thread or 'nuts'. Thanks for the great comments. 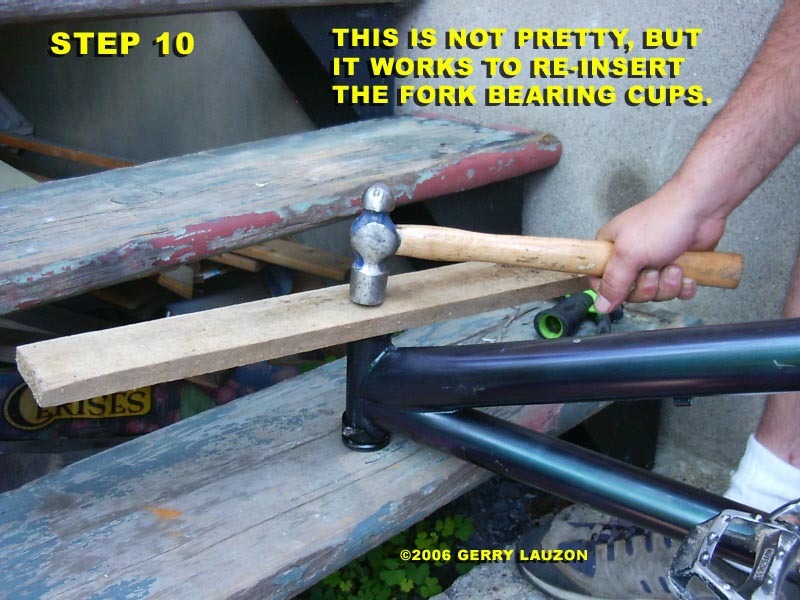 If you have a threadless fork like in the article, that screw on top must be removed out of the stem. Hammering it will only push it down and jam it in there good. HELLO CAN ANUBODY HELP ME? deck, your adjustment screw on top is too tight. hello, im only 13 and i just started to fix up one of my old bikes well anyways,on the front of the frame the very bottom part of the gyro is stuck on,my friend said just to use a hammer but its not working and i dont want to brake it. how do i get it off? Sorry young man, I can't really help you if I can't see the part itself. Have you tried a big pair of pliers? Maybe the gyro is crooked or rusted in? Was the bike left outdoors for long? Lot's of things you have to consider. Good luck and don't give up. Can you please help me. I am 13 years old and I love jumping and just cruising around the neighborhood with my redline BMX bike. I toke my seat of, and now i am having trouble getting it back on the bike. The seat has rails on the bottom of it, and there are barrings and stuff to put the seat on the seat post. So, If you no what to do please Email me at motoxkid71@aim.com. Thanks if you can help or advise! I have an old mongoose bmx bike from when i was little with mongoose labeled frame and tred on the tires. 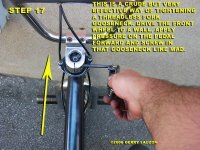 i was wondering if you could tell me how to remove the pedal brake so i can really use it as a bmx bike. You'll have to replace that wheel with one that has a freewheel hub. Thanks! I have one more question. The Chain on the bike always likes to fall off even when i move the wheel further away so theres more tension. Doing this makes it better for longer but it still comes off. do i need to re-align the gears the chain goes around? How? 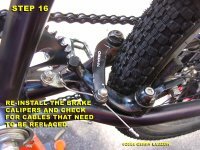 Make sure your chain line is straight by eye balling it. Also check and see if your chain ring isn't crooked or wobbly. Those could be the cause. Sorry, I can't understand the question clearly. Get a product called "release all" and spray the bolt with it. Leave it for an hour and then try to remove it. That's the only solution I know short of replacing the axle. Sounds like you need to replace the bolt itself. 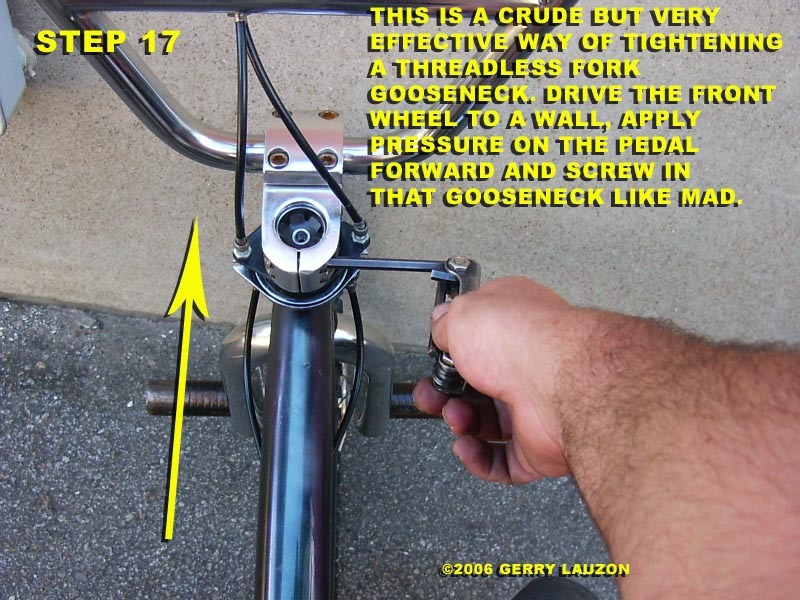 What keeps the handlebars aligned are the two bolts on the side of the Gooseneck. 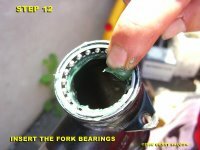 i cant get the bearing cover to go back on, i put the foorks through drop the cover over and have to wedge on this plasitic ring with a cut in it to make it go tight but it wont. help. Real BMXER, no offense taken, you are absolutely right. Rob, I'm sorry but I can't really help you out here. i bought a new cassette hub and laced it then put it on my brothers bike. the rim is completely true and the hub is working good. but the chain wobbles back and forth when you peddle. what would you recommend? Either the gear is not properly tightened on the cassette or your wheel is not set properly in the frame to give proper chain tension or your chain is too long. Apart from that, I don't see what else could be wrong. hey i'm really starting to get into fixing up bikes. i go to the local parts yard and find some really nice parts. right now i'm trying to fix a bmx bike up. it has pedals cranks seat. i cant figure out how to put the fork on. also would it be okay to put a mountain bike handle bars on could you help me? Hey Jon, I don't get what you mean by pedal crank seats. As for the fork, look up the link to the article posts on top of the blog. I have another article on fork assembly. I know this was a long time ago, but I came across your page while trying to figure out the proper procedure for tightening the headset on a setup similar to this. I eventually discovered that my top cap is missing, and so is the one from this bike. I'm sure this bike has long been scrapped, but what I had to do was order a cable-through top cap and star fangled nut to replace my missing hardware. Without the top cap, there is no positive retention for the fork. It's only held together by the pinch bolts.